Monday, February 4th, is Southern Nazarene University’s (SNU) Custodian Appreciation Day. 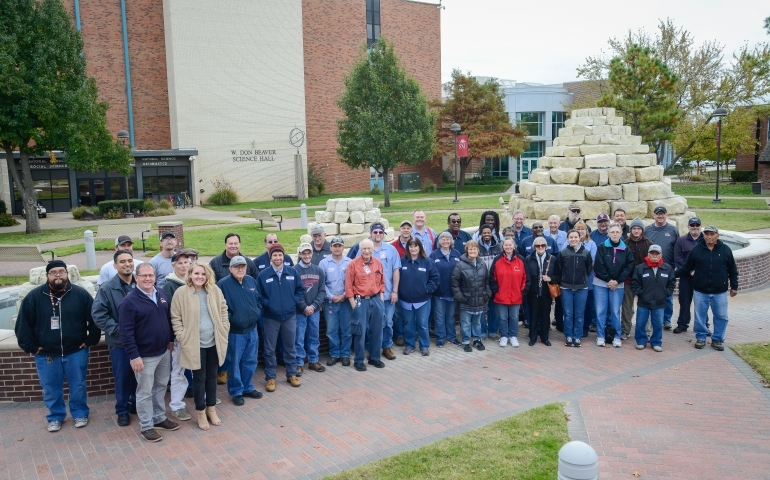 This is a day to honor the special group of people who work diligently to keep our campus clean and bring consistent friendliness and love to SNU’s community. Custodian Appreciation Day is an opportunity to recognize the people who do the jobs that go unnoticed. Without the custodians and grounds workers, nothing would go smoothly on campus. However, what most people do not know is how deeply dedicated many of the custodians are to SNU and its students. One of the most familiar faces of the custodial staff is Herb. Herb is the gentleman who can be found cleaning the library in the mornings, and most students know him as a kind and loving man. What many students do not know about Herb is that he has been working at SNU since 1982. Herb is not the only custodial staff member that loves what he does. Joy Sims, who cleans the religion building as well as Hills, is one of the friendliest people on campus. SNU student, Troy Vernier described Joy as “a literal joy,” emphasizing the powerful impact that the custodians have on the day to day lives of students. Joy has been working at SNU for a little over two years and loves her job. She freely admits that she will talk anyone’s ear off and loves getting to work in a place where she can interact with young people daily. She said, “I am able to express myself here,” and she explained the way that she has been able to encourage students daily, even by offering advice to young couples going into ministry. The most incredible thing about the custodial staff at SNU is the way that they open their hearts to the students and faculty daily. They are instrumental in creating the culture of loving your neighbor. Joy described attending chapel and being touched by the messages and pointed out how working at SNU has even helped to challenge her in her walk with God daily. Before Herb finished his interview, he kindly asked me where I was from and even asked how and when I gave my life to Christ. These questions touched my heart and reminded me that every person on campus has a story to share— all you have to do to better understand those around you is ask what that story is. Both Herb and Joy are wonderful examples of how to slow down and love others well. On Custodian Appreciation Day and every day after, slow down and say “thank you” to a custodian. Ask Herb about some of the craziest things that he has witnessed at SNU because he is full of stories. Let Joy talk to you about her family and her passion for people. Take a chance to get know the people that make our school a little more beautiful every day.